I wrote this as a journal entry some months ago while learning a lesson about why we sometimes get stuck in recovery and about surrendering… Hope you enjoy. When I was a little girl, I loved spending time with my dad. As a farmer, he worked around home often, but was gone long hours. One of my favorite ways to spend time with him was to be his ‘secretary’ when he went through his mail in the evenings. I got to use the letter opener on each envelope and we would chat about the mail or school, or I would tell him about the newest kittens. One very wet spring day, I mean really wet… it had been raining for weeks, and was raining some more… Dad and my brothers were doing “spring work” – which meant that now that the cold was over and snow was gone, the farmers could start seeding or working on the equipment in preparation for the summer harvest. I had asked my dad if I could go with him that day, but he had said no. I was heart-broken as he left the house. I remember that I was very emphatic about going with him, and I thought it was particularly unreasonable of him to deny my request! So, I pulled on my rain boots, ignoring the coat on the hall tree, and took off out the door to try to catch up with Dad. The ‘men’ (my dad and two oldest brothers) had taken off in a pick-up truck through the field towards the north. I could still see them and I was in luck; they had stopped briefly. I took my chances, it’s now or never. I crossed the gravel road by the mailbox and went down the ditch into the field that usually had either wheat or peas growing in it. But, at this time, it was only dark brown dirt – mud actually. Usually the field was not difficult to walk in – it could be full of dirt clods, or if there hadn’t been much rain, the ground could even be hard, dry and cracked. I was about to discover a third condition. I probably got about 10 steps into the field and found myself stuck fast. My boots were suctioned into the mud so that I could not pull them out, or take another step. There was no going forward, and there certainly was no going back. I was ankle-deep in mud at this point. I am sure that I panicked, and was probably crying, certainly shivering. Somehow, someone caught sight of me. I’m not sure if Mom saw me first, or if my dad or one of my brothers saw me, but pretty soon, here came Dad to the rescue. I am pretty sure that at this point a little panic set in because I could see that he was NOT happy. His jaw was set and his step was quick and heavy. But, he was my rescue and I was mighty glad to see him. I reached up to him as he reached for me. He began to pick me up like so many other times before, but this time was different; my boots held me fast in the mud. He tried again – nothing. My sock-less feet also held onto my boots naturally, so the boots wouldn’t come off my feet. My dad didn’t even blink; he wasn’t stumped. He told me to let my toes let go of the boots. 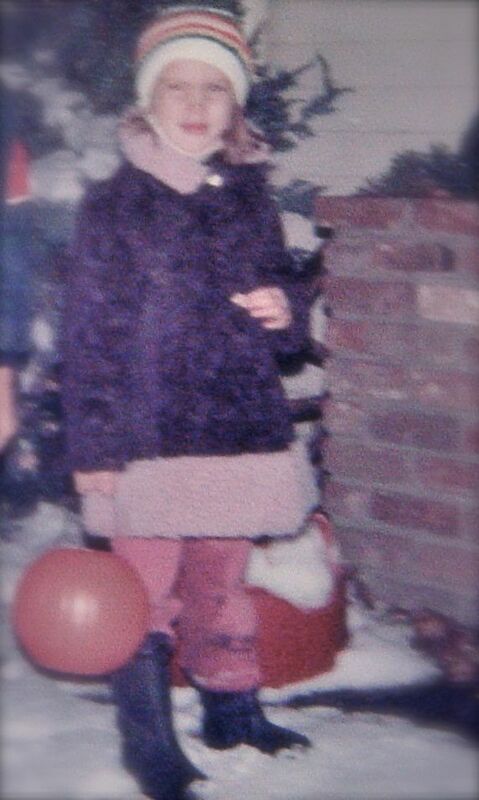 I know I hesitated – wondering why it was okay to let the boots come off my feet when for my entire life (all six years of it), Mom had been trying to make me keep shoes on my feet when I was outside. I finally relaxed – surrendering to his instruction – let my toes relax and yield the boots…. letting go of the thing that was actually keeping me stuck. He was then able to easily pull me up and carry me to the house – out of the rain and cold – out of the mud. I don’t know what happened to my boots. And, I don’t remember what happened after this muddy rescue – if I was punished or lectured or if my parents took pity and saw that the natural consequences were already lesson enough… I knew I had disobeyed and it got me stuck in the mud. I had disobeyed and it got me stuck in the mud. Lord, you are the only one that can pull me out of the mud when my actions, choices and behaviors lead me back into the mud. Like my daddy who came to my rescue and picked me up out of the mire as if it was nothing at all, I know that YOU are my only hope of rescue, not another unhealthy relationship, not food, not shopping, not losing weight, not numbing out on video games, not vegging out in front of the TV, or any other of the many coping mechanisms I use. You are strong and willing to pull me out of the mud. Lord, help me always be willing to be willing to leave my boots of disobedience, unforgiveness, pride, isolation, idolatry, right there in the mud. Please Lord, pull me out of the mud, set my feet on the solid ground again. Please forgive me for disobeying. Show me which path is for me. Please help me to follow that path carefully, purposefully, with wisdom and discernment from you. Show me when I put my rain boots back on and start out across the field, not on a path at all… but blindly heading right back for the mud pit. Help me recognize my notions or intent before I even am able to get ONE STEP into the field, off the road. After the Lord brought this memory back to me during this lesson in recovery, I found the sweetest pair of little girl’s pink rain boots and bought them. They hang in my closet now – a daily reminder. And, luckily – they DON’T FIT! Stuck.. hummm.. I am not sure how many times I felt as though being stuck in the MUD of life’s ordeal from my toes to top of my head. But, I am certain principle 3.. consciously choose to commit ALL my LIFE and WILL to Christ’s care and control is my way OUT.. I am pressing forward everyday with the notion that I practice this principle a little bit more each day.. I may just get myself a cute boots to wear.. one that looks like cowboy boots.. not sure why they appeal to me sooo much.. love love this blog post.. you sure have a talent of writing.. I want a pair of cowboy boots too!!! I’ve been thinking about that – how funny! I think I like boots because they are made to walk through the muck of life and somehow they look better to me when they aren’t perfect! I also agree completely – when we choose to give up our life to Christ’s care and control is exactly when we finally FIND a LIFE – one worth living!!! This story truly represents our constant struggle to be our own boss. It has gotten me into some deep mud. Great lesson to learn, thank you! Just started new book reccommended by pasted Mark, “Emotionally balanced Christianity”. Interesting. Just started it. This is a perfect lesson our Lord’s love and patience for us! Thanks for sharing. Love the picture of our Father in this childhood story.